In stock 99 items in stock. You can tell by our large assortment of tweezers that we here at SparkFun are way into picking up tiny things. To make sure we're always up to date on the latest in 'tweezing' technology, we're always buying and testing new tweezers. Okay... tweezers aren't exactly the most exciting thing in the world, but they are super handy. These are nice, solid curved tweezers. They have a very fine tip which allows you to pick up very small parts with precision. This is a great tool to have if you're working with surface mount components or anything with very small parts. The ESD-safe coating will also help prevent electro-static damage to sensitive electronic components. The best part? They're bright red and have the SparkFun logo printed right on them! 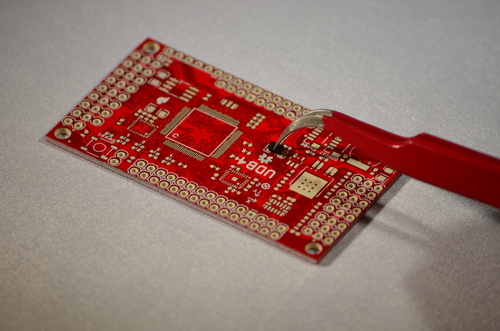 These tweezers work well to place SMD components on a PCB. They are also useful for removing parts during rework! When are these coming back in stock? 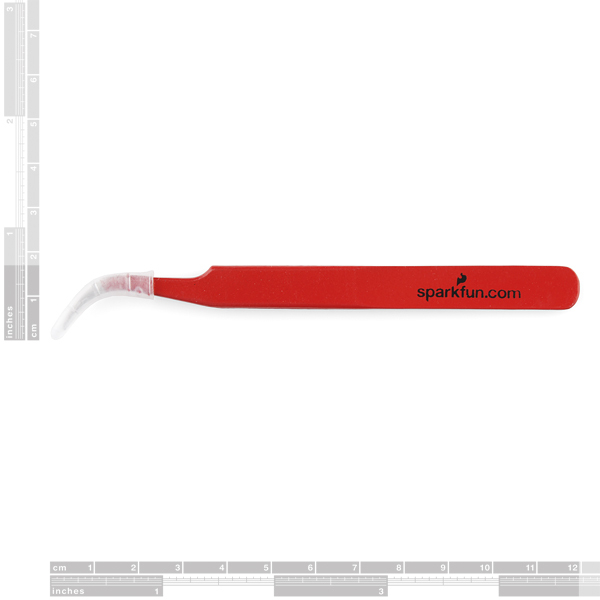 I NEED (NEEEED) ESD safe tweezers with a Sparkfun logo on it! Aw, who are you kidding? These are gonna be used for hard to reach nose hairs. Especially the ESD parts. Wouldn't want to interfere with your brain waves with static. The tips on the pair I got were SCARY sharp. Took some nippers and solved that though. Protip: take a marker and scribble some lines on the cap so you can find it more easily. great idea... but I used plastidip ---> 1/2 way up the cap. This is my first kit with surface mount components. I failed the mount off a bonding pads of the capacitor! Sadness. The component mounting surface is not so obvious as that. I would like to find a drive plate for this type of welding. Are these really tweezers? Or just SF branded eyebrow pluckers. I personally wouldn't use them as anything but tweezers. They've got sharp tips. These became an essential tool for me within minutes of opening the box. 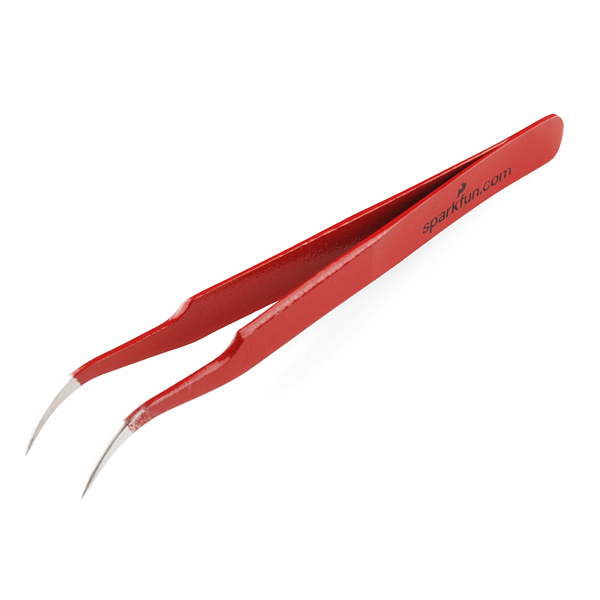 I want to echo what Member #144038 said: These are great tweezers. They have an almost "machined" tip that is razor sharp, they have a nice spring action, and appear to be made of a harder material than my cheap-o set. These things are very good for surface mount parts. They are also helpful on removing hard to grab parts. Not sure if the price is good. I just threw them into an order and didn't do much research. Worked out pretty good though. I bought these and loved the pointy-ness of the tips.. until I dropped them once... ONCE... and the tips bent outward and I could never quite get them as finely tuned again. Wish they were just a tad heavier gauge metal, or thicker along the taper. 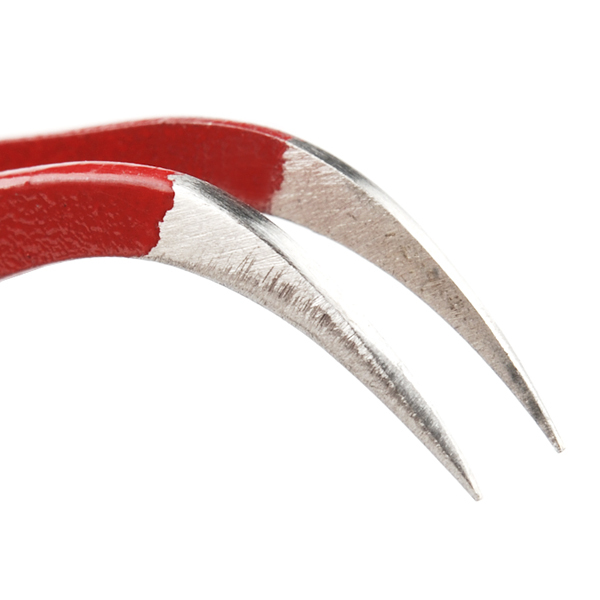 The tips are VERY pointy and sharp, which is great for small parts. I use these for general all-purpose handling of small things, but where I find them really useful is in working with SMD components. If you don't have a Pick and Place machine, these tweezers are your best friend. I've used these to hold components as small as 0402 SMD resistors in place while hand-soldering, as well as for placing components for reflow soldering. I like the curved tip, especially when placing SMD components, as I can brace my hand against my work surface and still be able to place the component vertically. Very handy (pun intended) when trying to pick up SMD parts. Makes handling parts a lot easier than with fingers. Definitely worth having a pair.